Photo By Jennifer Fumiko Cahill Pasta for lazy, end-of-summer days. Photo By Jennifer Fumiko Cahill Zucchini, as the Romans do. Our version of a heat wave is around 75 degrees. Still, who wants to cook when there are lawn chairs to be filled and bocce balls to be rolled? If incoming waves of zucchini and tomatoes (it's good to have friends in Willow Creek) are keeping you in the kitchen, here are a couple of recipes to get you back out in the sun while we've got it. A friend of mine was wilting in the summer heat in Rome (oh, boo-hoo — you're in Rome) when she found a vendor at an outdoor market selling ice-cold zucchini sticks in newspaper cones. The guy was squeezing lemon juice and sprinkling salt over each cone as he passed them out to sweltering Romans. The veggies are refreshing and portable, though a glass is nicer than newsprint. If your zucchini are fairly thin (like an unpeeled banana), cut them into sticks as they are. If you've got monster vegetables, slice them lengthwise and remove the soft, seedy center first. Fill a large bowl with water and ice cubes and set it aside. Bring a large pot of water to boil and cook the zucchini for about 3 minutes, until they are just tender (go ahead and bite one — it's not like you can't spare a tester) and their skin has gotten a little brighter. Don't go too long — you don't want them mushy. Remove the cooked zucchini and plunge them into the ice water. Keep them in the bowl for a few minutes until they are icy cold, changing out the cold water if necessary. Lay the sticks on a plate with paper towels to take off some of the water. 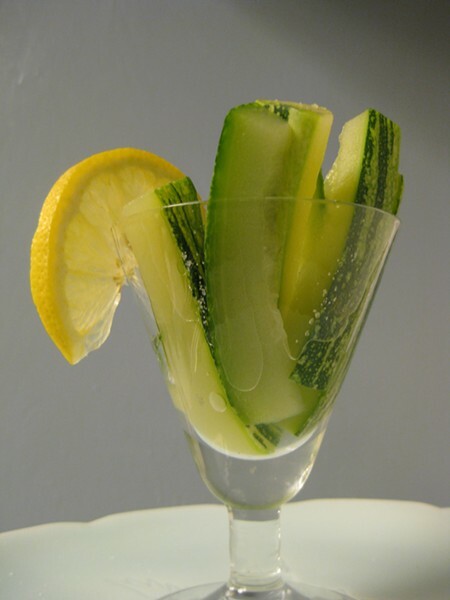 Divide the zucchini up into 4-6 cocktail glasses and squeeze a wedge of lemon over each one. Finish with a pinch of sea salt just before serving, and then breeze in with the glasses on a tray like you just zoomed in on your Vespa. Now let's tackle those tomatoes. This warm weather pasta dish comes together quickly and sits for a couple of hours so the flavors can mingle and you can go out and enjoy said warm weather. A scoop of ricotta or slices of fresh mozzarella on top make it a full meal. 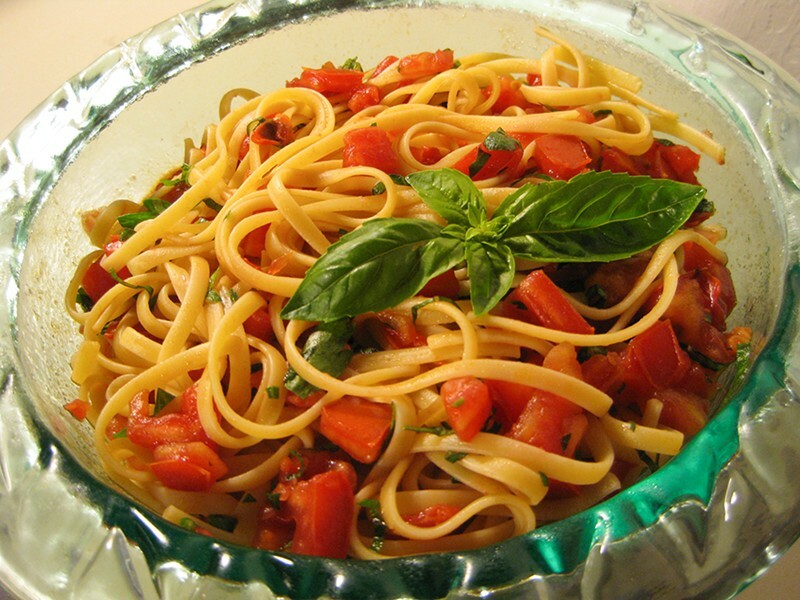 Mix the tomatoes, basil, parsley, olive oil and salt in a large glass bowl. Cover and let sit at room temperature for 1-4 hours. Cook and drain the pasta, then toss it with the tomato mixture. Serve with cheese for something heartier. That's it. And look — the sun's still out.